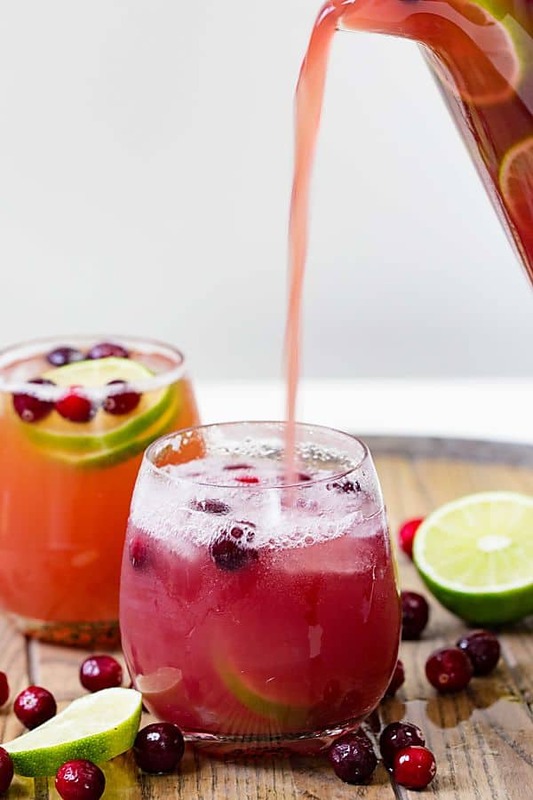 Cranberry Pineapple Punch is my new go-to party cocktail. 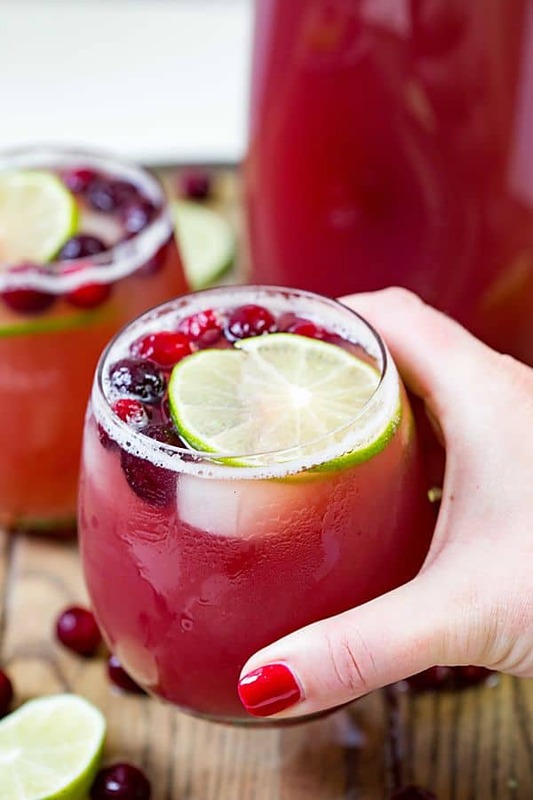 It can be made with or without alcohol and it’s perfect for holiday parties! I’m sitting at my desk writing and looking out of my office window. It looks out over my backyard filled with huge 40-year-old trees. I’m so lucky because my backyard is one of my favorite places on Earth! I can see the chickens wandering around my neighbor’s yard, the apples on the tree outside my window and the ground is covered in Fall leaves. It fills me with so much happiness I could burst! When I see the leaves on the ground I start to think about Thanksgiving and Christmas. The reason I love these holidays is that I get to spend time with my friends and family! I partner with Kroger and they recently had me and my blogging friends out to their office for a #BloggerBanquet! We got to chat with the awesome people at Kroger to learn more about ClickList, how they develop the new products that they bring out and tour the largest Kroger store in the country. There was even a little Christmas caroling in ugly Christmas sweaters. It had everything we needed to get into the holiday spirit! The best part was the #BloggerBanquet! We each prepared a dish and shared it at a big dinner at the end of the day! It was so much fun!!! I knew a lot of the bloggers and got to meet even more in person for the first time. We had a blast and it was exactly what I love about the season. There were about 20 or 30 of us and I was in charge of the cocktail. I knew right away it was going to be a pitcher drink. I didn’t want to be stuck behind the bar while all my friends were having a good time. I also knew that I wanted to serve something up that would be just as good without alcohol. About half of the bloggers there don’t drink and it’s the same at a party right? At any party, you’ll have someone that doesn’t drink or isn’t drinking to be the safe designated driver and I wanted to make sure that they weren’t left out. I settled on the Cranberry Pineapple Punch because it was a beautiful color this time of year but it also has a bit of a tropical flavor. It makes it taste so refreshing and adds a bit of sunshine into these dark winter days we’re heading into here in Portland. I made two pitchers one for each drink, with and without alcohol. Because the pitchers were identical I marked the one without alcohol with a napkin around the handle. That way there isn’t any confusion. With a label, the pitchers could still get switched up. This way you know everyone can find their drink. I’d also freeze some fresh cranberries and use them to garnish the drinks. That way you can keep them cold longer without watering them down. 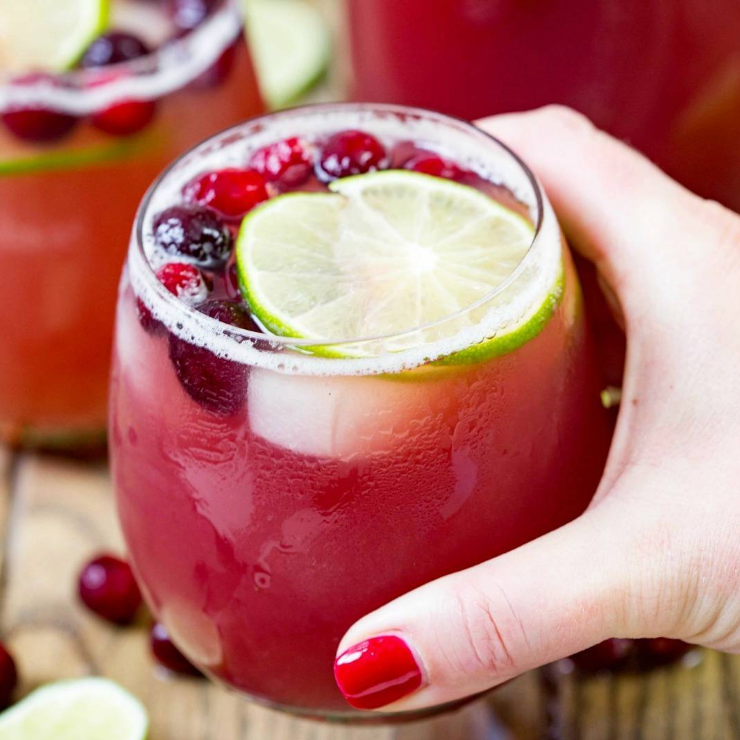 Plus, the cranberries and sliced limes look so pretty together floating in this gorgeous drink! 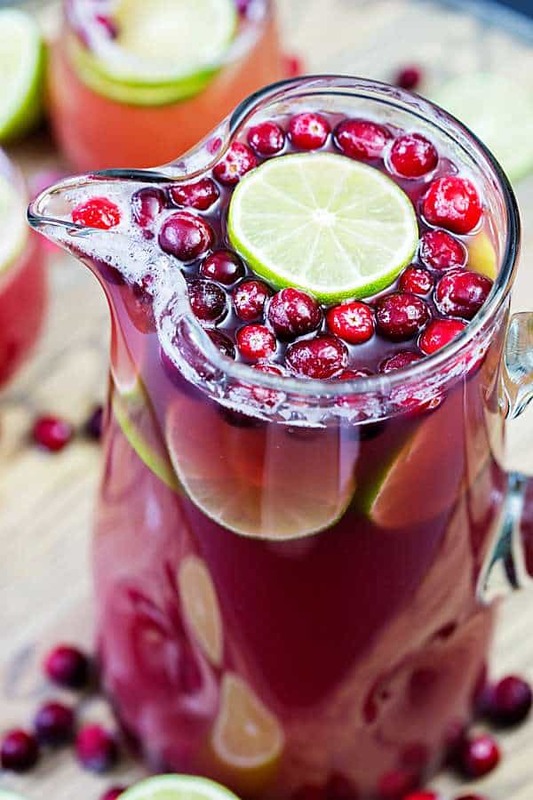 Cranberry Pineapple Punch was such a hit I had to remake both pitchers three times! I love the flavor of the drink so much! It really is nice to have a bit of a tropical hint especially the rum version. It makes me feel like I could be either sharing what I’m thankful for or sitting on a beach relaxing. It’s a total holiday win in my book! 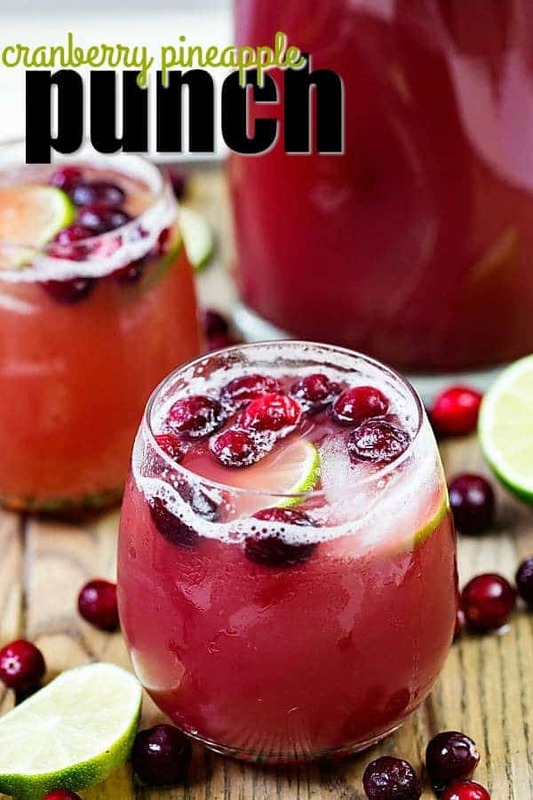 Cranberry Pineapple Punch is my new go to party cocktail. It can be made with or without alcohol and it's perfect for holiday parties! Any suggestions if you want to make it non-alcoholic but still want the coconut flavoring from the coconut rum? Would Torani coconut syrup work? Hi Tracy! You could substitute Torani coconut syrup to get that flavor without the rum. I’d add 1/2 cup more of each juice and then start with 1/2 cup of Torani. Mix, taste, and add more coconut syrup if desired. The syrup is sweetened so this punch will come out a bit sweeter than the original. How would it taste without alcohol? Nice punch! I can prepare this for parties or small gathering with friends! I noticed that one of the ingredients was Coconut Rum, my daughter is alerica to Coconut. Do you think using Spice Rum instead would be a good substitute? Will be bringing it to our Thanksgiving Supper. Hi Kimberlee! Silver rum would be the best substitute if you can’t use the coconut rum. The spiced rum would seriously alter the punch and take away from its bright flavors. Hi Ashlee! If you want o make this an N/A punch, I’d add 1/2 cup more of each juice and then start with 1/2 cup of Torani coconut flavored syrup (to replace to coconut flavor from the rum). Mix, taste, and add more coconut syrup if desired. The syrup is sweetened so this punch will come out a bit sweeter than the original. Hope this helps! You could use a coconut flavored vodka or a plain vodka + coconut syrup, but the taste will be slightly different. I would not use gin. Hello, this looks great. do you use straight/pure cranberry juice for this, or more the ocean spray diluted type? Also, is silver rum “regular” bacardi type rum? Thanks! Hi Sarah! We used a straight cranberry juice, not cranberry juice cocktail (diluted type). The silver rum is “regular” Bacardi type rum. Basically not spiced or dark rum. 🙂 Hope this helps! How much does this make? Wondering what size pitcher/container to buy? Could you substitute half of the ginger ale with prosecco or champagne? Hi Chelsea! If you want to substitute champagne for the ginger ale, it will change the flavor profile of the punch slightly. That being said, I would use as Asti over a prosecco or champagne since it’s sweeter and would still bring that sweetness into the punch. Could I make this with champagne instead of rum? Not a fan of ginger ale any suggestions on substitutions? Hi Margie! You could use lemon-lime soda or champagne (I’d recommend an asti for the sweetness). Ok-recipe is great …now to all of you asking about substitutions…seriously??? One says they don’t like ginger ale-do you really think you’re going to be able to pinpoint it as ginger ale given all the other flavors involved? Also proseco is NOTHING like ginger ale. She makes it this way, it would be nice to respect that I lieu of asking her for substitutions given the fact that this is yummy just the way it is. Julie, you’ve been super sweet and very kind in your replies to these ridiculous questions-I’ve made this as is and I wouldn’t change a thing! totally agree! People try your own versions on your own….stop with the dumb questions. I’m having a party of 50 guest and plan using a drink dispenser that holds 1.5 gallons. Do you recommend I make it by the pitcher to your specifications here until the dispenser is full or multiply the ingredients and make it in one large batch? Hi Toyin! You could do either really. You’ll need a double batch to get 5 quarts of punch (for your 6-quart container)…or you could triple it and not use as much fruit in the drink dispenser. You may have a little more punch than will fit in the dispenser though. Hope this helps! Just made some… it’s very good. I nice balance of the flavors and does have a little tropical taste(I like) I did wonder why mine was not very red and just noticed I bought cranberry juice cocktail ? Instead of just cranberry juice. Don’t make that mistake or it will be more the color of apple juice? I’m so glad you liked it! It sounds like another excuse to maek it again! 😉 Happy New Year!! Not a fan of coconut-would you just double the other rum? Hey, just wanted to know when you say top off with ginger ale does that mean add 2 liters to the mix?? Yes, you’ll want to pour the ginger ale into the pitcher until the pitcher is full. Depending on the size of your pitcher all the ginger ale (or not) may fit. If it doesn’t all fit, you can pour a little more into each glass once you pour the punch in. Great recipe!! Was absolutely delicious. Thank you for sharing! Thank you Traci, so glad you like it! Not a fan of rum but I love cranberry and pineapple. I was going to try making it with vodka. Wanting to make this for a going away party without the alcohol, but my store doesn’t have coconut flavored Torani. Any suggestions? Will it be good without the coconut flavor? Shouldn’t be a problem, you will just have a bit more tangy flavor. Let me know how it works out! These look really good!! Simple flavors, but taste Awesome! Thanks for sharing! !Merry Christmas!!!! I ended up having to use a gallon pitcher as the 80 oz pitcher fit only the juices and rums and there was not enough room for the entire bottle of ginger ale. And even using the gallon pitcher I couldn’t fit the entire 2 liter bottle. It tastes good even without the ginger ale. Oh I will have to try that! I used a little more pine apple juice than cranberry juice and it was delicious. Very good drink. I would probably keep the ingredients around to throw a pitcher together for any gathering. Glad you could adjust it to your liking! Good idea to keep the ingredients around especially when company pops by. Hi Robyn, I’m not sure what you mean by “there is a cranberry pineapple”. Are you saying there is a ready-made cranberry + pineapple juice? If yes, you want the total amount of juice used to be the same as the recipe states (8 cups) and then prepare as directed. This looks so refreshing! This will be nice for a day outside in the summer! One of the major reasons this was created and shared! You will love it. looks so refreshing! Simple flavors, but taste Awesome for the summer! thanks for your sharing! Wow, this drink is delicious, after a tiring day with a cup of cool water this is great. I noticed in your article you said you made both alcoholic and no alcoholic versions for your party. In the comments you offer some suggestions for converting the recipe. Do you have actual amounts you used when you made the non alcoholic version. You mention having to remake both versions 3 times during the party. 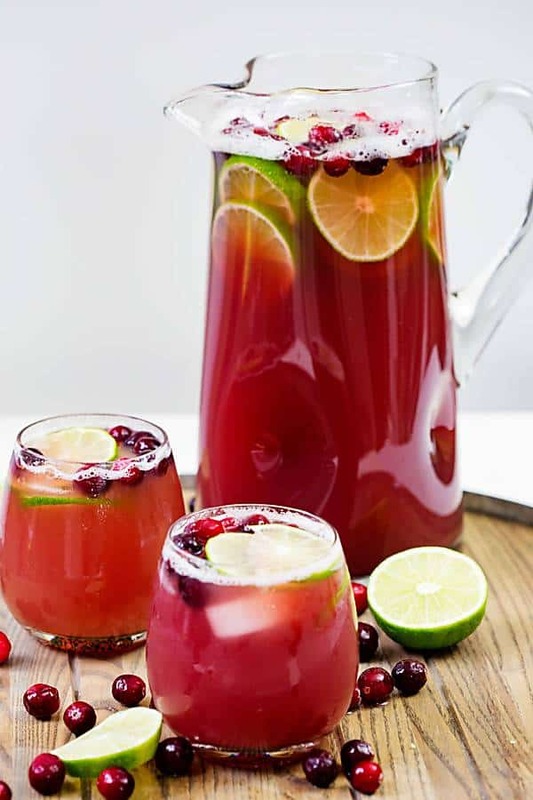 You could just substitute the cup each from the alcohol and add a cup each of the original juices, or just omit the alcohol altogether and leave the ingredient amounts just the way they are. Is the cranberry juice sweetened? What about the pineapple juice? It’s the juice you would get in the refrigerator section of your local grocery store. Just served this at my birthday and everyone was thrilled. Thanks for such a great recipe. So glad to hear that! Thank you. What Brand of cranberry juice would you recommend? Cranberry Juice can be based on personal preference whether you like something more tart or sweeter, but I have used so many different types. Oceanspray is usually the most accessible. If I top off with ginger ale in an individual glass, what’s the ratio of punch to ale? You’re just topping it off so it’s in your complete control. Pour the amount of punch you would like then add the ale. Whats the non alcoholic recipe? The same as the recipe listed sans the alcohol. Do you recommend using Malibu or Bacardi coconut rum for the coconut rum? Thanks! I personally prefer Malibu Rum but honestly, have used both and it is very tasty either way. Thanks for sharing! I love the flavor combo, wouldn’t have thought of that. It would be nice for summer and winter! Yes, it’s a great all year round drink!! Thank you, Vanessa. Well, now I have plenty of ideas what to bring to a party I’m attending! These look great, thank you. Awesome! Thanks so much, Boyd. Thanks for this fantastic recipe. Can’t wait for summer to make it and have friends come over. It’s such a great refreshing one for the summer, but remember you don’t have to wait as it can certainly be made all year around!